I am a new homeowner and know literally almost nothing about home improvement. I would like to learn basic concepts by doing things one at a time...but I can't just jump in and do most things. Are there any good resources (websites/books) that provide project ideas or tutorials that are organized from extremely basic to very advanced? I could use this to start with things extremely basic and learn skills and get ideas as I go. Welcome! You will certainly find lots of specific questions and answers on this site but not as many general how-tos; it is after-all a Q&A site. Firstly, you need some tools! There is a great thread on this site about the tools everyone should own, I suggest you give it a read! The internet is a great resource and you will find answers to almost any problem or project you have. If you are looking for some more general knowledge, I'd recommend taking a look at the books section of your local hardware store. They usually have some good beginner books on plumbing, electrical, painting and other common around-the-house work. This particular book rated well on Amazon in the "how to do everything" category. Certainly high up on the list of common tasks for home owners are basic electrical and plumbing: Changing light fixtures, switches, dimmers, thermostats, unplugging drains and toilets, replacing faucets and/or components. Typically, the easier projects revolve around replacing existing components , whereas more complex projects involve new installs or big modifications. Also take a look at this sites blog as it has some good walk-throughs. If I can give you any advice it is that you can do anything you put your mind and hands to - don't be afraid! Read-up and give it a try! But also know when you are in over your head and you should bring in a pro. Stay away from serious electrical work, and never try anything gas-related on your own. 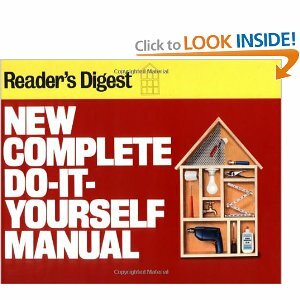 Pick up a copy of New Complete Do-It-Yourself Manual from Reader Digest. 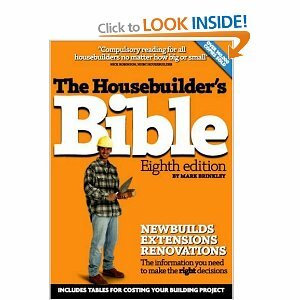 This is an awesome book, and a great resource when you're just starting out in home repair. Well, I'm not sure how your inspection report went, but mine was a "great" list of home improvement ideas! But really, you need to figure out what your house is lacking, make a list, figure out the complexity of each job, then go from there. Your home will give you ideas on what projects that should be done, because you will see things that need "improving". Start small and work your way up to larger projects. A small project would be one you could complete in a day or less and should not require any specialized skill set other than following instructions and using some basic tools. Bigger projects require planning, more resources, a more comprehensive toolset, and will take longer than a day to complete. It also might require professional help (specialized trade) as well and knowledge of building codes. So plan and choose wisely before tackling any big projects. Learn by doing a project First of all, the best way to learn DIY home improvement skills is by working on a project. It's difficult to learn something as tangible and hands-on as home improvement in the abstract, so learning in a situation where you can apply your new knowledge is helpful. Learn in multiple ways There are many ways to learn how to do home improvement. You could watch youtube videos or read how-to guides on the internet, you could learn by hands-on trial and practice, or you could learn from a teacher or knowledgeable friend. But honestly, the best way to learn is by doing at least two of these things. Ideally, you'll want to use instruction, whether digital, classroom or in-person instruction in combination with hands-on trial. It is shocking how things that look easy when someone else does them can take practice, but actually applying what you're taught with your own two hands is what solidifies your knowledge. Vision - define what you want to accomplish. Whether that is completing a specific home improvement project or learning to use a new tool, think about the outcome you want. This will keep you motivated as you go and, of course, provides the context for learning these very hands-on skills. Deconstruction - break your vision down into it's parts and steps. This is a key moment for information gathering and you're trying to assemble all the information about what goes into a home improvement project - what tools are needed, what materials and supplies are needed, what are the steps to do this project, are there multiple phases to this project, etc...? As I mentioned above, Deconstruction is definitely both cognitive and physical; it's a step where both digital information and hands-on trial are useful. I like to watch youtube and instructional videos and then start tinkering. For instance, before I installed my ceiling fan, I took the new fan I purchased apart. Taking it apart helped me understand how it would go back together. Practice - The best tip I ever got from a professional was to practice before actually doing home improvements. The thing about home improvement is that if you mess up, it can be a pain to undo your mistakes. Most home improvement pros and experts make practice cuts on scrap materials, test out stain and paint before they use it, dry fit pieces before attaching them, etc... Sometimes practicing means you'll need to buy extra materials, but it's worth it to make any mistakes ahead of time rather than on your house. Construction - now that you've deconstructed your project into its parts and individual steps, it is time to put them back together. Construction, like deconstruction, is both cognitive and physical. You have to put all the pieces together in your head and then actually start working on your actual home improvement project. As you go through your project, you may find opportunities to weave practice moments in, which may make things more efficient. You may also find something unexpected during your project and have to go back and do some more deconstruction to figure out how to handle it. The biggest thing for me when it comes to construction is to know that setbacks and hiccups are normal in home improvement. Be ready to have something go wrong and have a plan - whether someone to ask for help or somewhere to turn for more information as you solve it. I've never used google helpouts or ehow now, but I know both of those services offer the ability to video chat with home improvement experts. If you don't know someone to ask for help in the event of a setback, turning to one of those services might be a good alternative. Reflection - this is the most important step! During reflection, try to think about your project and what went well, what didn't go well and what you would do differently next time. It's this thinking that actually turns the information you gathered and the things you did into knowledge! Studies have shown that reflection can be the most important part of any learning journey. There will always be things you could have done differently or better, and actually recognizing those things and thinking of how you could improve upon them is the signal that you have actually gained know-how. Have Fun and Be Brave! It is really easy to be intimidated by DIY home improvement projects. But gaining experience is the best way to become more confident in your abilities. Be willing to consider doing projects yourself. If you get into the planning phases or deconstruction and realize you want to hire someone to do all or parts of it for you, it's easier than ever to make that happen with tools like Angies List, Thumbtack, Red Beacon and Porch. But you have to at least be willing to consider doing it yourself before hiring someone - definitely don't just assume you can't! You might just surprise yourself. I would focus on a particular skill or system at a time, plumbing, electrical, painting etc. Once you get bored of one move on to another, but this allows you to feel like you're making progress in a lot of different areas. For each project, Google away. I've also found it useful to have some books handy for electrical, plumbing, etc. Got friends with DIY aspirations? My friends and I set up a work party rotation. We regularly help out with eachother's DIY projects. Usually at least one person knows something, or can do the research, and we all learn from eachother. You'll still need the other answers about books, projects, etc. as a starting point, but teaming up really makes the learning take hold faster with less effort. If you don't have any projects of your own yet, you could just offer your help. You can learn a lot while being someone else's third hand. Not the answer you're looking for? Browse other questions tagged new-home or ask your own question. When buying an older home that has recently been renovated, what should I look for in the home inspection? How can I find out if I can add a bedroom to my home without violating any rules/ordinances? How can I determine the style, design, and manufacturer of this tile?